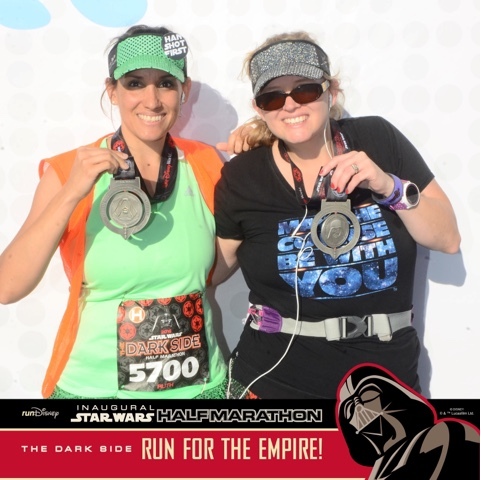 Home » Blog » Healthy Living » Star Wars Darkside Half Marathon – RECAP! 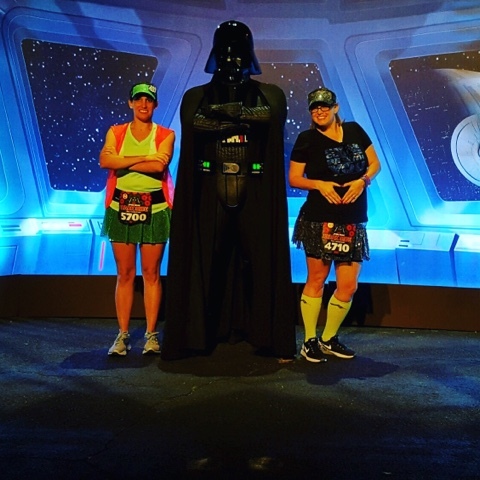 Star Wars Darkside Half Marathon – RECAP! 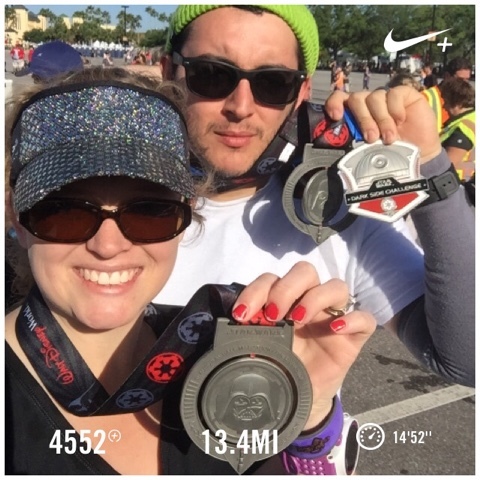 I was so excited to be able to participate in the Inaugural Darkside Star Wars Half Marathon. 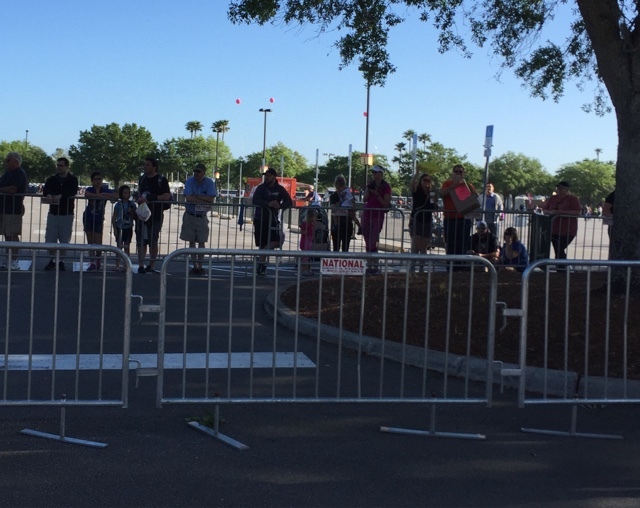 We had a busy day prior to arriving at the race Expo, and we were anxious to get there and talk to runner relations because there was a glitch in the system and my husband’s proof of time wasn’t read. Thankfully he had put all the information in a notes section of Active and RunDisney was able to (within seconds) place him in the appropriate corral! He moved from Corral J all the way up to Corral D [insert happy dance]. 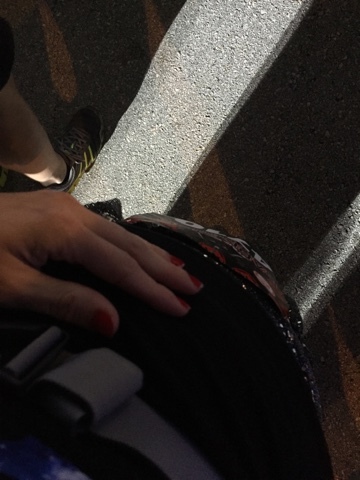 Since I am expecting, and had zero intention of stopping for anything except maybe a bathroom we agreed that he should run in his corral and I would run in mine (Corral G). Prior to the start of the race, we took several pictures with some star wars characters and just had a lovely time enjoying the pre-race vibe. My sister was also running the half but was in a different corral. I also advised her to run her own race and have a good time, because I knew I wouldn’t be pushing myself (at all) for the race. My only goal was to finish before the sweepers. The race started and I moved as far over to the right side as I possibly could and began my 30/30 intervals. I’d decided it would be short enough intervals to keep me distracted, and I wouldn’t get my heart rate up too high too quickly. 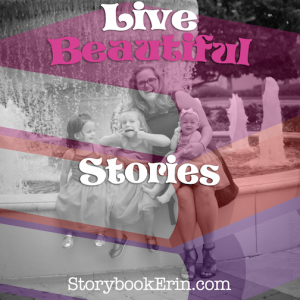 On Friday I took a one-hour glucose test at the doctor to test for gestational diabetes and was still feeling “off” so I really just wanted to do my own thing. My sister must have passed me around mile 2 because I received a text message with her 5k split a few minutes before I made it to the 5k mark myself. I never saw my sister, but that’s alright, we were all running our own race and having as much fun as possible. Let’s talk about the start of the race, we were in Epcot and IT.WAS.AWESOME! We entered Epcot from the back (like think underneath test track) and ran around World Showcase for a bit. Since it was still quite dark when we ran through it, all of the buildings had white lights around the top, and there was Star Wars music BLASTING through all the speakers. I’m not a huge Star Wars fan, but whatever nerdy ounce I have in my body was thrilled. Running through Epcot while the sounds epic light saber battles are all around you? Best start to a race EVER! After Epcot, we entered onto the boardwalk area and ran the path that connects Epcot with Hollywood Studios. The course was quite narrow at this point, and as annoying as I was to all those around me, I continued to stick all the way to the right hand side and run 30/30 intervals. Hollywood Studios was also pretty Epic. There was a large stage in front of the Chinese Theater with Kylo Ren and some storm troopers, you know encouraging you to “move along”. I had every intention of taking a picture, but … I didn’t. I got distracted by the ambiance, and just kept moving. After HWS we entered the first long (and boring) stretch of Osceola Parkway. 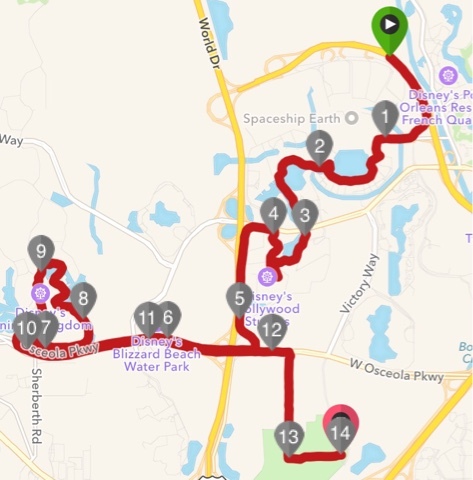 One thing they did, that I wish they’d do more of during other half marathons is they played movies every mile or so on the long boring stretches! I mean, it’s not like meeting Jedi Mickey (Who was no where to be found) but it’s pretty cool and distracting! Before I knew it I was entering the Animal Kingdom. 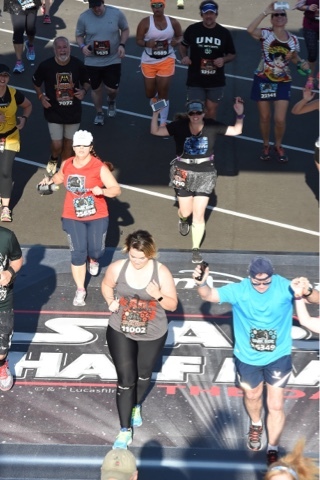 I got a little emotional during this part of the course, mostly because I was having deja vu from when I ran the Marathon (pregnant with Baby 2). The sun was rising, and everything just looked so pretty! I had a good time running though the Animal Kingdom and took advantage of a REAL bathroom and sink to wash my hands. After the Animal Kingdom, we entered the final stretches of Osceola Parkway. I’d started to slow down at this part, but was still well above the 16 min mile requirement so I was comfortable with my slowing pace. Before I knew it I was turning a corner into the woods and running on a dirt path entering EPSN Wide World of Sports. The crowd was vibrant was we entered ESPN and it was here that the tears just fell. I’d done it… My knees still felt great, and I was approaching the finish line. My dad and younger sister had come to chEAR us on with signs, so I blew some kisses to them and then headed for the finish line. Where my older sister had waited for me so we could take a picture together! This was not my fastest half marathon, in fact, it can go on the list as one of my slowest. However, it was the most fun I’ve had running a half marathon. 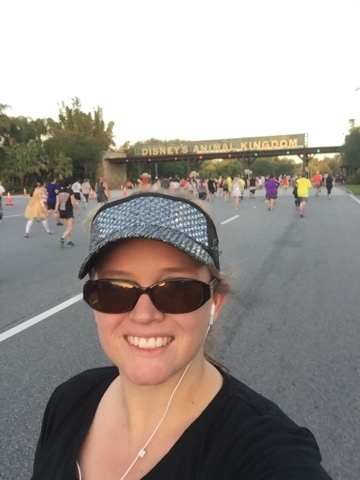 I loved this race so much, and think it’s a great addition to the RunDisney races! The Question of the day, who would you dress up as for a Star Wars themed race? Achieve your Fitbit Step Goal without leaving home!